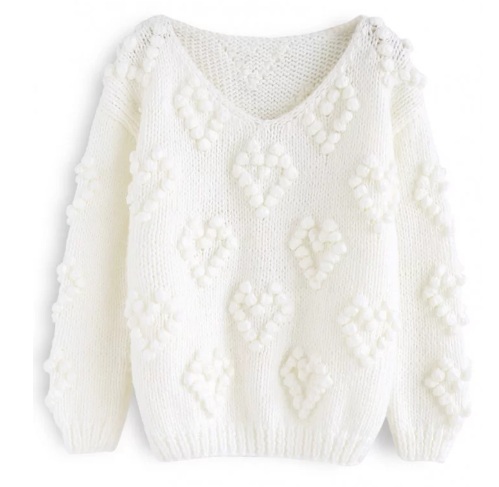 Posting a short & sweet blog post about one of my favourite cozy sweaters from Chicwish. I love a good winter white and I wanted to share this little find with you all! I’m pretty sure I have too many white sweaters to count, but this one is super warm (especially for these freezing temps we’ve been having!) and so fun with the knitted heart patterns. You’ll probably recognize this pattern from a previous blog post as I have the cardi version in an off-white/cream colour, which is another super cute option. I posted on the blog back in November and you can find the post/shop the cardi here! I’ve linked the v-neck pullover below, and a few additional colours because they’re all so adorable! I’ve also linked my thin tortoise shell hoops below (1st pair on the left) and a few other ones (with links) I love from around the web. I’m really into tortoise shell print these days, especially for accessories. I find it always pairs back nicely to black, white and neutrals!